The dock from the front; 2x USB ports (1 of which is powered) and the combined speaker/mic audio jack. Is the desktop dead yet? Well with the 4th Gen Lenovo X1 Carbon (i5-6300U/8GB/256GB) and the ThinkPad OneLink+ Dock it might as well be! This powerful little dock has just a single cable to plug into your laptop which provides power and connectivity to the dock. Going by the Lenovo website (Super long Lenovo link) this dock will work with the ThinkPad X1 Tablet, ThinkPad P40 Yoga, ThinkPad Yoga 14, ThinkPad Yoga 260, ThinkPad Yoga 460, X1 Carbon (4th gen), X1 Yoga. Even though only one of the front ports is ‘always on’ powered the second port has no issues in powering up and running a 500GB Freecom USB Hard Disk Drive. So as you will have seen from the photos this screen has no issue in running 3x screens; but what about 3x screens while running a video on each screen, hammering the USB 3.0 port on the front running Crystal Disk Mark to a USB HDD, with audio streaming and my phone on charge? I certainly couldn’t notice any issue and the CPU on the X1 stayed below 22% through the test. In the past I’ve seen docks like these kick out a fair amount of heat (when under load in particular) and while you can feel some heat from the OneLink+ dock it really isn’t much at all (only a few more degrees Celsius above its ‘off state’). In addition some laptops seem to ramp up their internal fan when attached to a dock – in this case the X1 Carbon behaves and under ‘productivity tasks’ I couldn’t notice the fan noise at all. 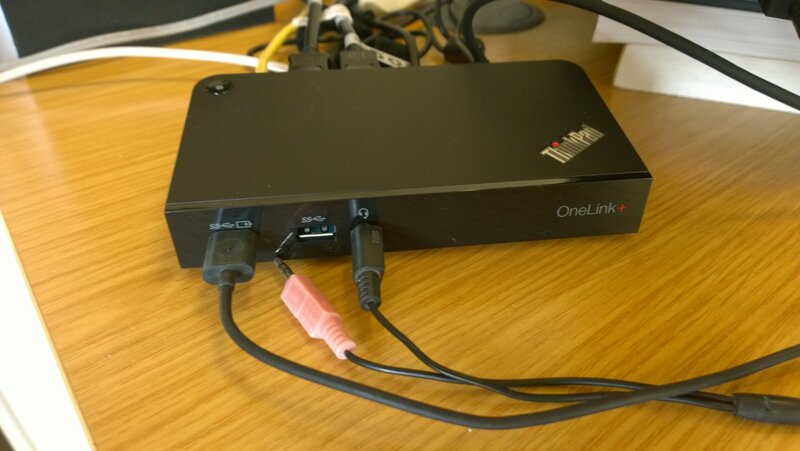 I would prefer to see the VGA port replaced with a further display port (on high resolution screens VGA really does not work well) the Lenovo ThinkPad OneLink+ Dock really is an excellent bit of kit; not once have I looked back on my desktop and having extra desk space is just an added bonus.